this time, we'll dive into the deep waters of SAP table authorizations. Security consultants are often asked to check/ensure secured access to tables. So, let's see how SAP allows us to limit direct table access. 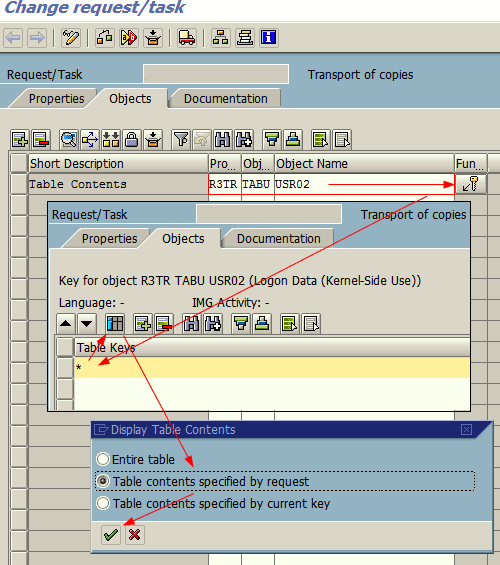 "Direct", as we are dealing with the SAP standard tools for displaying table data on-screen in this article… not to be confused with business transactions that work with (the same) table data, too. Standard table browsing and maintenance transactions: SE16, SE16N, SE17, SM30, SM31 etc. The authorization object S_TABU_DIS controls access to tables via an Activity (ACTVT) in combination with a Table Authorization Group (DICBERCLS ≈ dictionary Berechtigungs-class… nice denglish, SAP :smile:). Table Auth. Groups combine an arbitrary number of tables with a similar "purpose" or contents; e.g. the group "SC" ("RS: User control") includes hundreds of tables containing user master-, address-, audit- and similar data. Each table can only be assigned to a single Table Auth. Group. The assignment of tables to Table Auth. Groups can be maintained in SE54 (or directly via SM30 for view V_DDAT_54). less than 20% of all tables are assigned to a Table Auth. Group on a recent IDES system… and the rest ? – all other tables automatically belong to the fallback group "&NC&" (= "not classified"). If you want to check this yourself, just compare the number of entries in table DD02L (with AS4LOCAL = "A") to the number of entries in TDDAT (with CCLASS ≠ "&NC&" and ≠ ""). you always have to grant access to all tables linked to a group, which often feels like taking a sledgehammer to crack a nut. This is a major lack of granularity! It allows granting access by individual tables names (wildcards are allowed, but only at the end of the TABLE value). S_TABU_NAM and is only considered, if a previous check for S_TABU_DIS failed (it's an additional check after S_TABU_DIS, not a replacement). Thus, it's now possible to grant display access to a complete Table Auth. Group while limiting maintenance rights to selected tables in that group. Check out SAP Note 1481950, Note 1500054 and the related ones mentioned therein — strongly recommended. 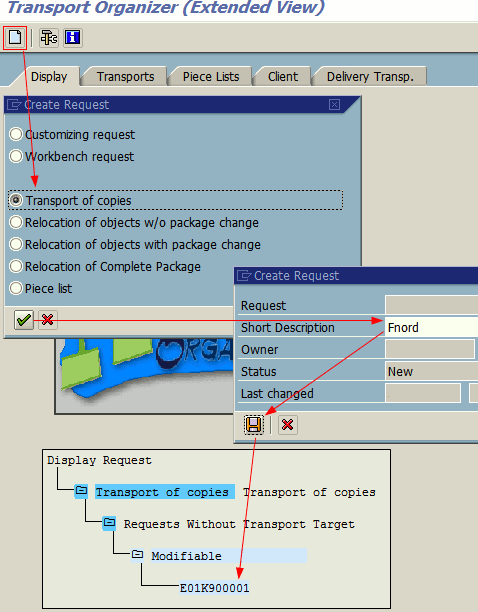 Client-independent tables are shared among all clients of a SAP system; modifications to their contents have an impact on the whole system. Hence, changes to them require special care and must only be allowed for users who know about the possible side-effects. 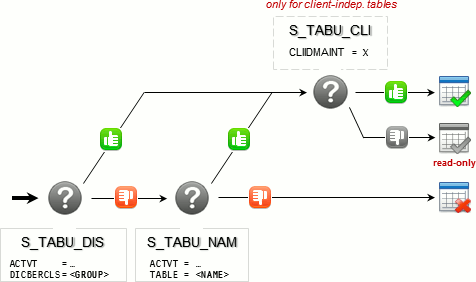 SAP mitigated this problem by providing a supplementary authorization object, which is only checked when trying to maintain client-independent tables in addition to S_TABU_DIS and _NAM: S_TABU_CLI ("Cross-Client Table Maintenance"). The allowed values for its only field CLIIDMAINT are "X" (allowed) and " " (not allowed). Most client-independent tables are customizing tables, so the main audience for this right is administrators and supporters. At this point, we took a look at the basic measures for table protection; it is time for the pitfalls one might want to avoid! A common mistake, (overworked) authorization admins often make when they're asked to clean up table authorizations is to just remove SE16 etc. from S_TCODE but leave S_TABU_* as it is. Transactions are nothing but a convenient way to execute programs, optionally passing parameters along. This means, removing SE16N from S_TCODE, but allowing for instance SA38 or START_REPORT does not necessarily prevent direct table access. It's not a big deal, since table authorizations are checked as usual… but keep in mind: removing the tcodes from S_TCODE has a limited effect unless you also take care of S_TABU_*, S_PROGRAM and S_DEVELOP (check SAP Note 1012066 for the last one)! (*) Direct module pool execution is possible through a strange speciality in SE38: if a module pool name is entered in the first screen and then executed, SAP internally searches for tcodes using the same program ("SELECT * FROM tstc WHERE pgmna = <NAME>") and arbitrarily executes the first one! This is done in class CL_WB_PGEDITOR, method EXECUTE. In the last chapter, we've identified the programs behind the most common table transactions. Unfortunately, they're not the only ones, which point to the underlying programs. A user might hit on the idea to search for a tcode, which executes a program he/she isn't allowed to execute directly – SE16 or SM30 in our case. To assess this risk, we have to search for other tcodes (in table TSTC), which use the same programs (in the field PGMNA). Check your system! Parameter transactions execute an existing transaction delivering pre-defined screen input. For example, the transaction code SM30_PRGN_CUST is a shortcut to SM30 for the maintenance view PRGN_CUST. When you call it, SM30 is executed with "PRGN_CUST" in maintenance mode. Since the option "Skip initial screen" is selected, this tcode jumps directly into the table maintenance view itself – if it wasn't selected, one would be able to override the given screen options, including the table name! That's the point where the weakness starts. The first one – VYCM – is safe, because the "/*" indicates that the first screen is skipped and thus the view name cannot be overridden. The second one – VYCQ – just calls SM30 and fills in the given view name "TKKVBLERM"… leaving the choice of the actual view name up to the user (due to "/N")! So, to determine all unsafe parameter transactions for SE16, SM30… you need to search for PARAMs matching "/N<TCD>" (e.g. "/NSM30*"). Now we're ready to face the truth: there are ways to avoid S_TABU_* checks! All customer programs are as secure as the developers made them! SELECT * FROM pa0008 CLIENT SPECIFIED. WRITE: / pa0008-mandt, pa0008-uname, pa0008-pernr, pa0008-ansal. REPORT. TABLES: pa0008. " HR Master Record: Infotype 0008 (Basic Pay) SELECT * FROM pa0008 CLIENT SPECIFIED. " SAP Client, User Name, Personnel Number, Annual Salary WRITE: / pa0008-mandt, pa0008-uname, pa0008-pernr, pa0008-ansal. ENDSELECT. Note: UNAME is actually the user, who last changed the record; to get the SAP user related to the employee, check this comment. Many function modules do not perform (sensible) authorization checks, as they are intended to be called from within reports – which are assumed to do those checks instead. If users are allowed to "test" (i.e. execute) FMs, most protection measures become pointless! Concerning table access, this means that in the worst case, the standard checks from the first chapter are just ignored. Try SE37 with "TRINT_DISPLAY_TABLE_CONTENTS" to view any table you want! 😯 … ouch – no S_TABU_* check! Update: meanwhile SAP fixed this and added a proper check to the function module - check Note 1716236. Allowing users to debug with replace (i.e. S_DEVELOP with object type DEBUG and ACTVT 02 & 03) is extremely dangerous, since it allows stepping over parts of the code (e.g. AUTHORITY-CHECKs) and change field values (e.g. SY-SUBRC thereafter)! This means that almost all authorization checks are useless, as they can be bypassed or the return code can be changed. The only checks, which are unavoidable, are kernel-based authorization checks – like S_DATASET. Watch out: replacing variables creates a system log message; check SM21! Being authorized to create a new transport request and include a table’s contents is equal to SE16. Btw, there is no need to release the request; it can even be deleted later – without leaving significant traces. See also SAP Note 1237762 → Solution → Item 4.
being able to test function modules on production is russian roulette for your system security! debug with replace on any productive system is evil! really!